No one wants to think about the unpleasant stuff that lives deep down in the carpets you walk barefoot on, play with your kids on, or do yoga on. But now that you’ve thought of it, and you know it’s there, you want to get rid of it and fast! Not to worry. Our residential carpet cleaning crews love that stuff…and love getting rid of it for you. More than 90% of Brothers’ residential carpet cleaning business comes from repeat customers and their referrals. We must be doing something right. Find out why for yourself. We have residential cleaning plans to fit your busy schedule—and your budget. Brothers Cleaning is well-known for our residential carpet cleaning services because of our outstanding cleaning capabilities and our trustworthy team of technicians. Every Brothers carpet cleaning member is thoroughly trained and certified to our industry’s highest standards. Each one has been through an extensive background check, too. We don’t want them in our home if they don’t check out…and neither do you. As a result, we provide you with the highest quality carpet cleaning in a friendly, honest, caring, and professional manner. 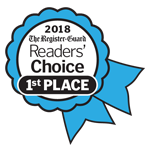 That’s why we have won (#1) the Register-Guard’s Readers’ Choice Awards 9 years in a row. We pride ourselves on the satisfaction of our new and long-time customers! Our Hydra-Master truck-mounted Hot Water Extraction System is the cleaning method recommended by major carpet manufacturers. This equipment is safe and the most effective of all residential carpet cleaning methods. Plus, we use the finest cleaning products and equipment to thoroughly clean your household carpets—removing tough spots, suspicious odors, and remedying problem areas. We believe in “cleaning green” to ensure that all products used in your home are safe for your family and pets, and won’t harm the environment. Your carpets, rugs, and furniture will last longer if they are professionally cleaned by experienced professionals. Your vacuum just can’t get all the abrasive dry soil that eventually scratches and degrades your carpet’s fibers. That’s a key reason carpet manufacturers require professional carpet cleaning as part of their warranty and for ongoing care. Many even specify the hot water extraction system that Brothers Cleaning uses for the greatest soil removal. You have better things to do with your weekend than to rent a “do-it-yourself” carpet cleaner. Sure, it seems convenient, even cost effective; but too often the results are fiber damage, yellowing, severe re-soiling, over-wetting and overuse of harsh soaps that leave a sticky residue and trap even more filth. Besides, you have to ask yourself where that machine has been and who used it last…and if it’s been cleaned before you brought it into your home. That’s why carpet manufacturers recommend professional carpet cleaning to avoid these troubles. Our goal is to make you a happy, long-time customer—one of the 90% who is so happy with the results of our cleaning that you will recommend us to everyone you know. Contact us today for a free, no-obligation price quote today!